With Ellsworth Medical's medical uniforms, you are sure to be the envy of your coworkers. 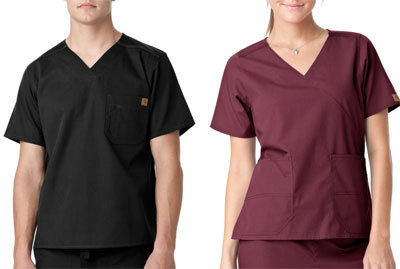 Now offering Carhartt men's and women's scrubs. Every month we pull one name from our Rewards program and the lucky winner receives a free pair of scrubs! To join our Rewards Program, call 860-298-9333 or come in to the store. Our selection of both solid and patterned scrubs is the largest in the Hartford area and is made with high quality fabrics that are both breathable and comfortable. And with our price match guarantee, you can rest assured that at Ellsworth Medical you will never overpay for your uniforms. With the Wonder flex and Carhartt Collection by CID Uniforms you can wear the same scrubs as your favorite television medical professionals. Made with a comfortable Dura-tech fabric with soil release, these stylish uniforms will keep you will looking great!